The Viking Verso is simply not a double-ended pencil— it is a double-ended pencil with a long, rich history. According to Viking, the Verso was introduced over 150 years ago in Paris at the International Exposition of 1867. Back then a Bavarian company Berolzheimer (sound familar? :) ) & Illfelder released a double-graded pencil. The idea of the double-graded pencil kind of fell off the radar for years until a German blogger and pencil aficionado, Gunther Schmidt (Lexikaliker) brought it to Viking’s attention. The interesting backstory is not the only thing that makes the Viking Verso so special— it is not an easy pencil to manufacture. The problem comes in when the pencils are getting their coats of lacquer and stamping: it is near impossible to tell which end is which. Other double-ended pencils are simple to differentiate as they are red and blue or colored and graphite. Viking had to refine their manufacturing process for the making of this pencil, but the result is super worth it. As a non-artist, I thought that I would have no real use for this pencil. After all, writing with a 4B would be a smudgy experience with constant sharpening. I found after a week with this pencil, that that 4B end would come in handy. Most of my pencil use these days is at one of my (3) jobs where I tutor high school students. The format is such that I have to take three-column notes for the students while they are up at the board working on a problem. I use the 4B side to sketch out the three columns and write the headings and then use the HB side to take the actual notes. I also have used the 4B side to underline things in my own personal journal. On top of this newfound functionality, the writing experience with the Verso is enjoyable. 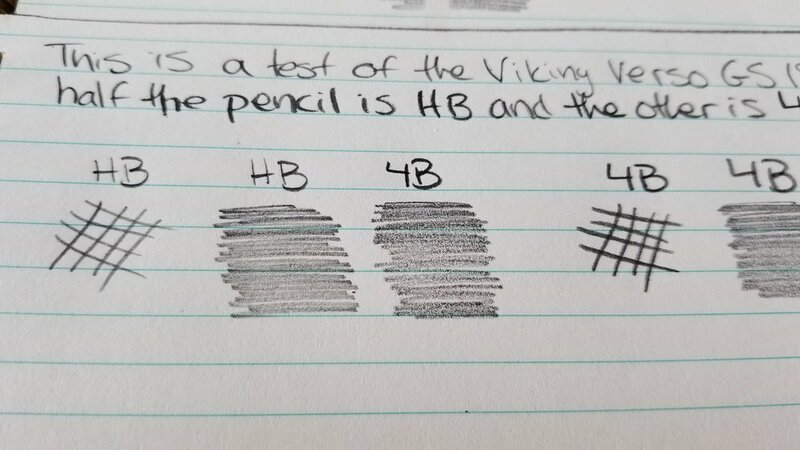 Like all other Viking pencils I have used, the graphite never has a gritty feel to it, lays down easily true to grade, and erases wonderfully. The finish is a work of art as one side is glossy and the other matte. Several layers of paint have been applied which adds a nice thickness and a softer hex to this pencil. The bright white paint that highlights the Viking brand with its popular Viking ship (a Knarr? Faering?) finishes up the slick look. These pencils aren’t cheap at $3.00 a pop, but are worth the investment— even more so if you are an artist. CW has them in stock and for those of you outside of the US, they can be ordered directly from Viking.